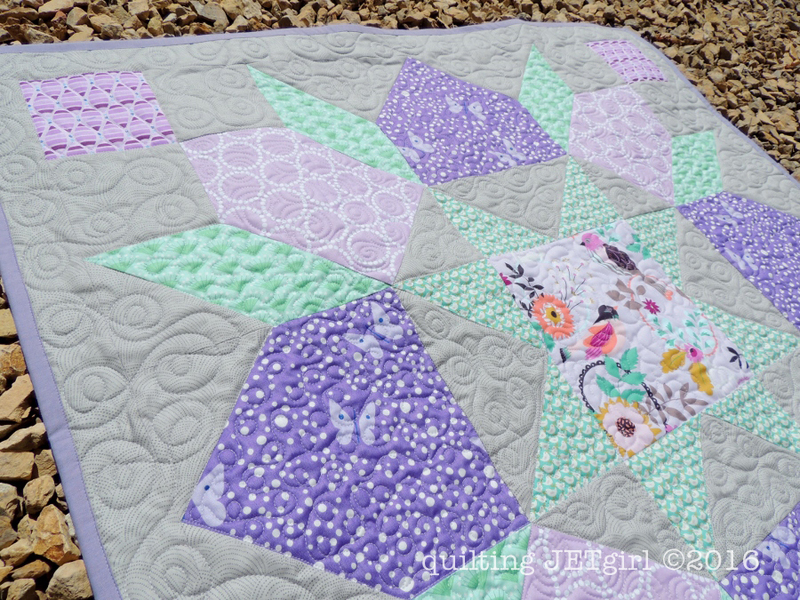 I just love how well the Lucent baby quilt came together! The Y-Seams pieced together nicely (there are 8 in the pattern to keep the printed fabric as single cuts), the colors blend together nicely, and the quilting was just an extra fun bonus! Just like in my original Lucent quilt, I quilted around each pieced fabric and used a different quilting motif for each print. 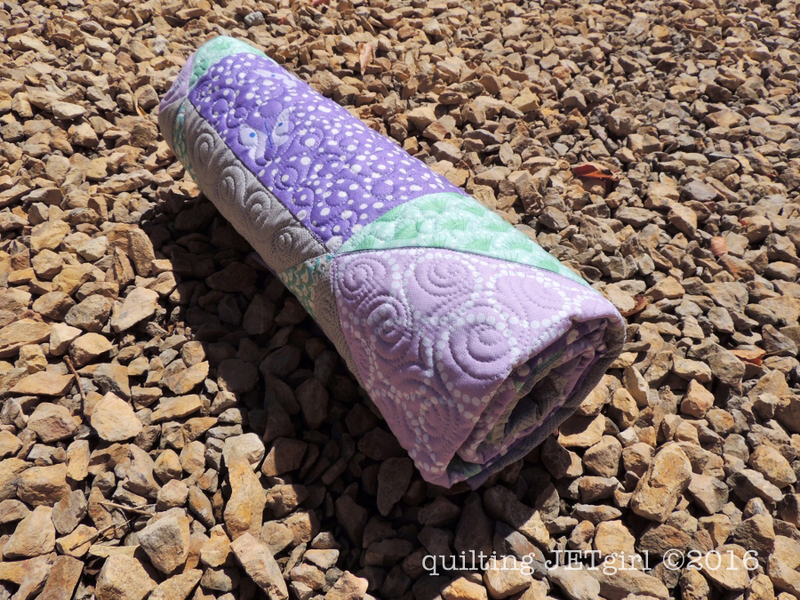 The backing and binding for the quilt are the same: Kaffe Fassett, Shot Cottons, Wovens in Lavender. It is super soft and a fantastic backing for a baby quilt, I think. 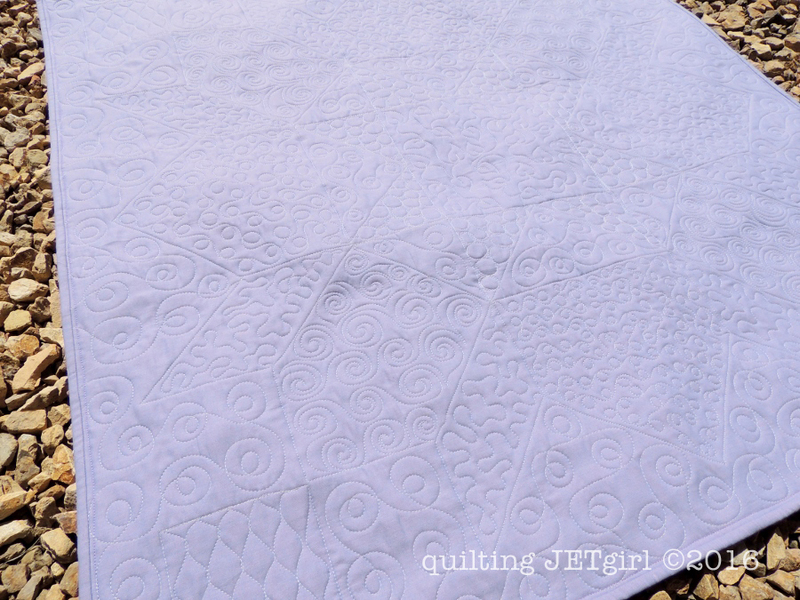 I used 50wt Aurifil 2600 (Dove) for the quilting. Picking a purple or green thread would have been fun, but the Dove just melted into all the fabrics leaving a nice texture. For the binding, I used 50wt Aurifil 2520 (Violet) and it blended wonderfully with the lavender shot cotton. In all, the quilt took me 7 hours to complete from start to finish. I hope it will be well loved in its forever home. I love this, especially the feature fabric in the middle. You are inspiring me to broaden my horizons and sew with more purple and lavender! This is a beautiful quilt. I like how you used different quilting for each fabric. It looks great on the back. The baby quilt is beautiful!!! Absolutely beautiful. I love it! And that’s one lucky baby who gets to snuggle under it! That turned out beautiful!! and only 7 hours??!! I have been tossing around pattern ideas to make for a friend who is due in October and Lucent has moved up the list–I’ve never done y-seams before though. I like to try new techniques, so it might be a go! Awww…this baby quilt is SO adorable! I love the color choices and especially the center piece is a beautiful fabric. And you did a really good job on the quilting 🙂 I think someone out there is very lucky to be gifted a baby quilt by you. Another winner, Yvonne! You really do sew with the speed of light–faster than the speed of sound! This is a beautiful quilt to be cherished. What a great quilt! It looks like a fantastic project to use up some stash. Very pretty! Love how you chose to quilt it! From start to finish 7 hours sounds like a pretty good turn around. 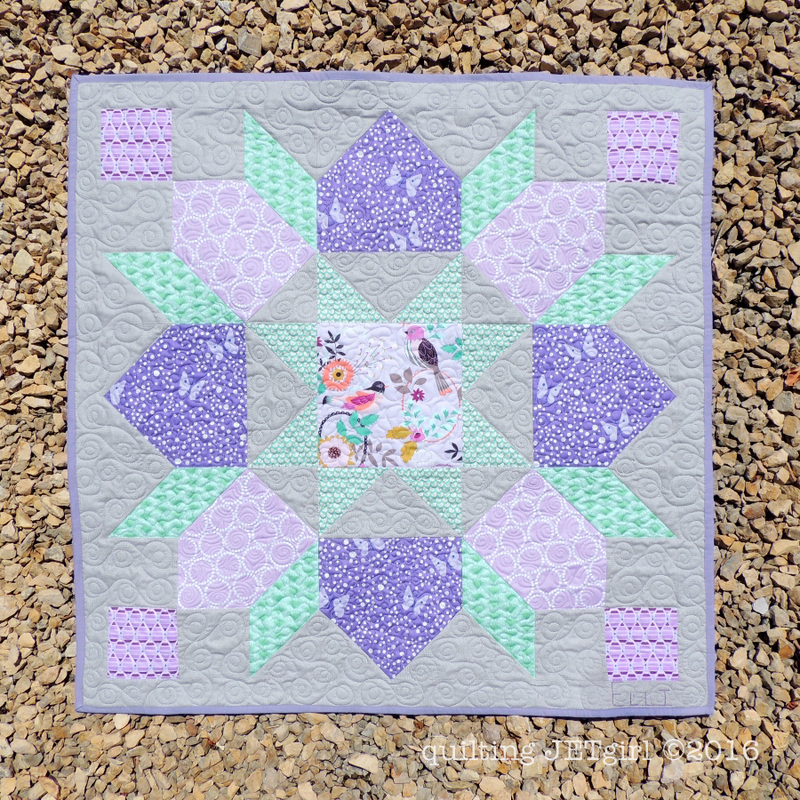 I love how the purples and soft greens play with the background fabric. I’m sure it will be well loved at its new home. It’s such a beautiful quilt! I love Kaffe Fassett shot cottons. I really do. (But you probably know that, since I always make your quilts up in them! 🙂 This turned out so lovely. I’m sure its forever home will appreciate it mucho. It will be well loved, Yvonne. The colors and pattern are beautiful. I just finished a quilt using shot cottons too! The feel of it after washing is amazing! The colors, fabric, quilting and design hit every high note! Gorgeous! I totally forgot Y seams were in the pattern. I bet this time they were a little easier! A super sweet finish! What a beautiful quilt to be treasured by a new baby! I love the quilting. Each of the motifs highlighting a different fabric provides a lot of visual interest. And you really are a jetgirl to finish it so fast! Winner, winner. This quilt screams soft and cuddly! Love it. Really nice, Yvonne! Love the choice of the Kaffe shot cotton, too — you’re right, it’s so soft! That is a great quilt in any colours, but I do love these, and wow that was fast piecing and quilting! That bird fabric has been on my wishlist. Love the way you used it here, such lovely colors for baby. Yvonne, absolutely lovely! So sweet and the colors are just so calming. Beautiful!! Soooo sweet! congrats on the finish. I love the way the quilt turned out. The colors are so sweet for a baby. I liked the way you quilted it it went so well with the design. I got excited and went onto Crafsy and got the pattern so I can make one. I’ll try and take a photo when it is done. Thanks for having the pattern available to purchase. The lavender is wonderful. I love this pattern. This is darling! I love how each print is quilted differently and your attention to detail with the y-seams. As usual, this quilt is gorgeous! Love all the colors and the quilting. Great when a plan and a Y seam come together! This is just a lovely sweet quilt, just gorgeous! Such a gorgeous quilt! I could see it being used from babyhood straight through adolescence and into adulthood–the colors and design are so timeless. Wow Yvonne it turned out beautiful! Y-seams can be a pain but when they come together it is a bonus. Love the soft colors in this quilt. I didn’t realize that the gray background has a subtle texture to it that is really nice. My favorite thing about this pattern is that you can use large cuts of prints. Definitely a plus!